We're in to the new year and I have been going through files and doing some updating in between painting commissions and working on some new bird art. 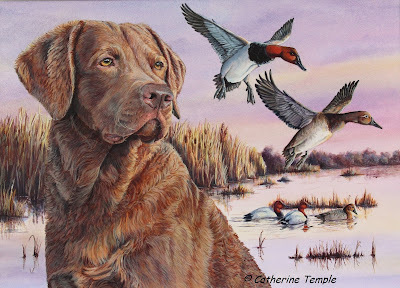 One of the commissions I'm working on is another Pudelpointer, which is NOT this painting. You'll have to wait until my client receives it to hear about that as it is a surprise I do not want to spoil. But in the midst of painting a thought occurred to me....what happened to Snidely? Some time ago now I had met and photographed this Pudelpointer puppy whose name was Snidely. 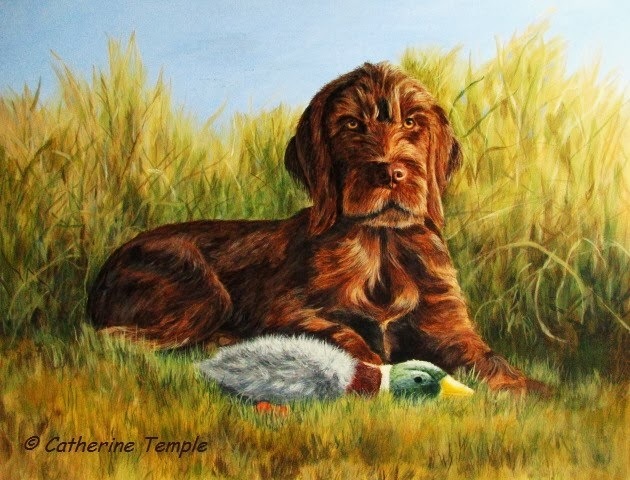 I wrote about it here and posted his photos http://www.catherinetempleart.com/2010/07/snidely-pudelpointer.html. Not too many months later his owner asked me to do a puppy portrait. The painting above is that portrait, now a few years old. Apparently, I neglected to post it on my own blog though it did appear on the Canine Art Guild's blog. So I searched through my portrait files and, sure enough, there he was! I thought I'd better give Snidely his due before I posted any more Pudelpointers. So here he is for all the world to see!